Malawi is a small nation but rich in natural resources, with lush forests and the famous World Heritage Site of Lake Malawi that makes up almost one-third of the country. Malawi also however faces problems with deforestation and improper land management with almost 90% of the population engaged in agriculture. The cultivation of tea & coffee as a cash crop provides an economic boost through direct employment and through foreign exchange earnings. 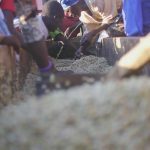 Growing coffee is incredibly hard work but for the coffee growers in Malawi it is rewarding work. Before the green beans are bagged for shipment, roasting, grinding and brewing the coffee growers have to plant and nurse coffee seedlings. The coffee plants then have to be pruned, watered and harvested and carried down the mountains of Northern Malawi. Those that grow the coffee live in an area without many of the comforts we take for granted. The Warm Hearts Coffee Club source their coffee from a Fair Trade certified co-operative with over 3,000 members- the Mzuzu Coffee Planters Association. Previous post: Welcome to Our Coffee Club!